As time moves on the chances of key historical documents being unearthed seems less and less likely. It therefore came as a welcome surprise when a 16-17th century St Helens Parish Register came to light in Gloucestershire. The register was discovered in a garage in Chipping Campden and eventually found its way to Gloucestershire County Record Office. Initially it was unclear which St Helens it referred to. It was only after our County Archivist identified familiar local surnames and other references that it could be established as an Isle of Wight document. It is unknown how long the register has been lost to the Island. 19th century historians seem to have been unaware of its existence. It covers the period 1593 to 1653. The fabric is in reasonable condition and all the entries appear legible. It will be a valuable addition to the Island's Record Office archives. They have just nine other registers dating from the 16th century. There will be much work involved in transcribing entries to their file system, although a copy of the document is available for researchers. A law requiring the clergy to record baptisms, marriages and burials was introduced in 1538. They were the key record of such ceremonies until civil administration became necessary in the 19th century. Parish Registers are, of course, crucial to family history research. Now full budget details have been published, it is clear they can only be met if the Archaeology Service loses two of its four permanent staff. However there is no evidence that councillors who reviewed the department ever intended staff to go. It may be the cuts are little more than an administrative blunder. The loss of half the Archaeology Service would have a serious impact on the community aspect of Island archaeology. The department would be reduced to an adjunct of the planning process. It seems unlikely that services such as the Portable Antiquities Scheme could continue and community digs would be a thing of the past. Unfortunately much mystery surrounds the process under which the Archaeology budget was established. The budgeted cuts are not detailed, but merely shown as a negative figure under 'Contingencies and Adjustments'. This implies whoever established the cut did so without any discussion as to how the savings might be achieved. The department was reviewed as part of the council's Headroom exercise. The key councillor in this review was Ian Ward, under who's remit the service falls. He has told the IW History Centre that he has no knowledge of how the cut in expenditure arose and, as far as he knows, the Council Cabinet never recommended it. Councillor Ward's apparent indifference to the outcome may indicate that confused responsibilities are at the heart of some sloppy budgeting. Councillors, not officers, are responsible for agreeing budgets. When the plight of the Archaeology Service was first publicised over a month ago, the IW History Centre wrote to the council with a number of questions regarding the review under which the budget was set. The council have so far refused to supply the answers, to the point where they have failed to comply with the Freedom of Information Act. It is difficult to escape the conclusion that there are aspects to this saga which might embarrass some individuals. In the year 2000 the authority carried out a review of the County Archaeology Service, involving the Chief Executive, Planning Department and English Heritage. Cuts were made at the time and the current labour level was set as the bare minimum required to serve the Island. The council is, of course, empowered to make any savings it deems necessary. Nevertheless it is also obliged to review departments in an informed way and be fully aware of the consequences of its decisions. During building alterations to a terraced house, the owner lifted a stone slab and discovered he could peer into an underground chamber. In spite of limited access, it was possible to scramble in and view a cellar so large it also ran under neighbouring properties. It has a number of separate sections and is clearly unconnected with the housing above. The question is, for whom was it built and for what purpose? 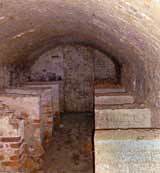 The cellar is located off the western end of Lugley Street. It is built of brick and stone with an entrance via steps down at the roadside, although this has yet to be cleared to provide proper access. It seems the brick uprights shown in the photo were spanned with large stone slabs, as one is still in place. There are also signs that this brickwork originally extended to the ceiling. The lack of proper access means the complex has yet to be surveyed and remains undated. Based on the photographs, it would appear to be a wine cellar. 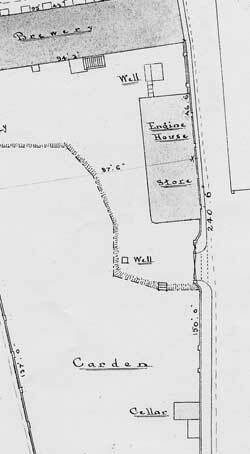 Initial research has uncovered an 1892 plan of the Anchor Brewery site (left), which identifies the cellar at the southern end of its land. On the face of it, a brewery with a wine cellar explains everything. However, if it was built by the brewery, why is it located in a separate garden area some distance from the rest of the buildings? It has been suggested the strange location may indicate that it's just a coincidence the cellar is on the brewery site. Perhaps it originally belonged to a rather grand house that stood on the spot. As yet research has failed to find such a property. As part of a house, it would have required another access from within the building. The doorway to one part of the cellar has been bricked up. Does this hide steps down from another entrance? It may require a degree of excavation to provide the answer.